We’ll now take a look at what the overall investing process looks like. A more concrete example will soon be available in the form of a step-by-step investment guide. First, you need to create an account with the platform. You’ll provide basic informations about yourself : name, date of birth, address. A few websites ask for a scan of your ID; it will be required anyway once you want to withdraw money so it can be useful to have one at hand. After validation a confirmation e-mail, your account is immediately ready. The whole registration takes a few minutes at most ! In the future, the registration process may require some additional documents, in order for the platforms to comply with the anti-money laundering laws. Next step is to deposit funds. All websites allow you to do this through a SEPA transfer; other options may be available as well. If you use an online bank it’s really a matter of seconds : just copy-paste the bank informations provided by the website. You may want to save them for later use, in the likely case you want to deposit more funds ! Just be careful to use the right instructions for the transfer (“reference text”), as they allow the P2P company to sort out the funds deposited by the different clients. The funds will usually be available for investing after 2-3 days. Note that it’s essential to provide your unique identifier on the platform every time you make a transfer; it’s usually called “Payment Details” or “Payment purpose”. I’ve highlighted its location in red in the following screenshots. Some platforms allow credit-card deposit but it’s not very common, and I would basically advise against it as it will reduce your credit card’s monthly limits. Some P2P lending companies offer extreme customization of your investing profile. 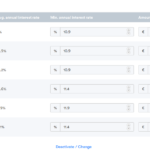 When investing manually, filters allow you to display only the matching loans. You’ll then be able to select the ones you want to invest in. Auto-invest feature will allow you to input the investing criteria you want, in a way similar to the filtering used when investing manually. You’ll also set the maximum loan size and your desired portfolio size; other options will usually control whether the interests get reinvested or not. Once started, the auto-invest will automatically invest your available funds according to your preferences, provided there are matching loans available. I only advocate using this feature on P2P platforms, where the loans are standard. While auto-invest is available on several platforms providing real-estate and business loans, you should examine these investment opportunities carefully before investing ! My favorite part 🙂 As the principal and interests are reimbursed by the borrowers, your account will grow. If you’re using auto-invest and chose to reinvest the profits, the system will automatically invest in new loans. The P2P lending and crowd-lending platforms provide statistics on your account, which help you keep track of your investments and portfolio’s growth. 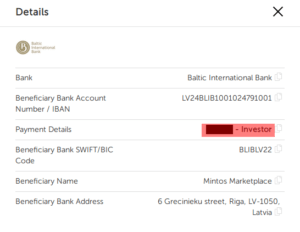 If you want to withdraw funds, you’ll usually need to upload a copy of your ID. Withdrawals are in my experience just as quick as fundings. As a safety measure, the withdrawn funds are always sent back to the original account they were transfered from. Note that withdrawing funds will often require to pause the auto-invest ahead of time, in order to have funds available ! Congratulations ! You’ve now finished reading our documentation on investing in loans. Use our index of reviews of crowd-lending and P2P lending platforms, and read the ones matching your investor’s profile ! Happy investing, and don’t hesitate to get in touch if you still have questions !